Super Hero Boy: The Bratz go video! I think I'm too old for Bratz dolls, seriously maybe I'm getting old fashioned in my older age but I never remember dolls when I was growing up to have any sort of fashion sense, Bratz even put poor Barbie to shame! Bratz Girlz Really Rock does have some positive messages for young girls such as diversity, the Bratz are a fairly multicultural group and they always seem to get along actually there is never really any deal made about the fact that they have diffrent skin tones of ethnic backgrounds they are just friends, and thats the way it should be. With that said I think I will leave Bratz to those super girlie girls who love things like Hanna Montana, High School Musical and of course this super high energy musical DVD. Honestly It just makes me tired watching them, though Connor did bust a move to the songs. heh. I didn't make it past the first five minutes until I was totally girled out. I know my younger girl cousins though would have a field day with this one. They would have an entire sleepover dedicated to it and would be standing up dancing and lip singing in their rooms. I guess I was just never that type of girl. 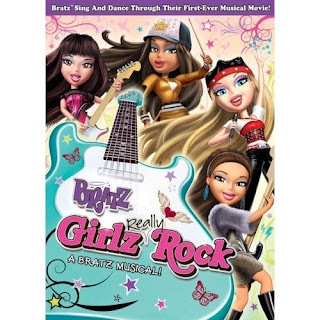 Bratz Girlz Really Rock is available on Amazon! Don't worry girls I didn't forget about you. I do have five copies of Bratz Girlz Really Rock for all those little princess out there. If you win I'd love to hear what your girls think of the movie. Leave a comment on this post. Check out Bratz Girlz Really Rock and tell me which Bratz is your favorite or who you would watch this with if you won. my niece would have me watch this with her about a million times! I've never seen Bratz, but I know that my niece loves them, so I want to win it for her. Her B-Day is coming up too and she would love it. If I won Bratz Girlz Really Rock, I'd definitely watch it with my niece, Amanda!!! She'd LOVE this!!! My daughter loves Jasmine, I'd watch with her. If I won this, I'd watch it with my nieces. They love bratz! I am getting old too-the other day I found myself being appalled at a girl in a too-short skirt. I swore I would never be that way! Anyway my niece loves the Bratz and I would watch it with her. If I won, I'd watch it with my youngest step-daughter who is a Bratz fan. I would watch with my grand-daughter Becca. Cloe is our favorite. Love them! My daughter would watch this and she loves Jade. My daughter saw a commercial for this yesterday and announced that she wanted it. I'd be watching with her! Thank you for having this. My daughter picked Jade as her favorite. I would love to win this to watch with both of my daughters. Thank you! I'd watch this with my daughter! I'd watch with my daughter, she loves the Bratz! I would probably have to watch this a dozen times with my daughter. My daughter loves the bratz. It is hard for us to buy her things as we have to other children one with adhd and another with autism. So most of our money goes to programs to help our autisic son. Thank you. My niece loves Jade and would like this when she comes to visit! My daugter would make me watch this over and over. My granddaughters love Bratz so this would be wonderful. Thank you. My daughters love Bratz. Chloe is my favorite & my youngest favorite. My oldest likes Jade. I'm subscribed via bloglines as well. Jade is my favorite, and I would watch this with my 3 Bratz crazy daughters! Thanks! My daughter love the Bratz and Jade is is favorite - it may be because they share the name! My daughter's favourite character is Cloe, thanks! i would watch this with my daughter if we won the dvd. jade is the best one. Cloe is our favorite. I would watch it with my boyfriend's daughter. Favorite Bratz is Cloe. Thanks! I like Jade and Yasmin the best. I am 21 and collect Bratz dolls, movies, and games...LOL...I would watch the DVD with my boyfriend also. Chloe is our favorite. My daughter loves the bratz. Shes got most of the movies. I love Jasmine the most, but all the girls rock. Please accept my entry. I would watch it with my daughter. She is big into Bratz and movies so this would be perfect for her. I would watch this with my daughter. She likes Chloe the best. My daughter would LOVE this movie, her favorite Bratz is Chloe. I am pretty sure my daughter loves Jade the best! Big Bratz fan here! My daughter loves Chole and we would love to win this, thanks. My little niece loves Jasmine! I would watch this with my granddaughter Lilly and my niece Mykkayla. I would watch this with my niece, she loves the bratz.